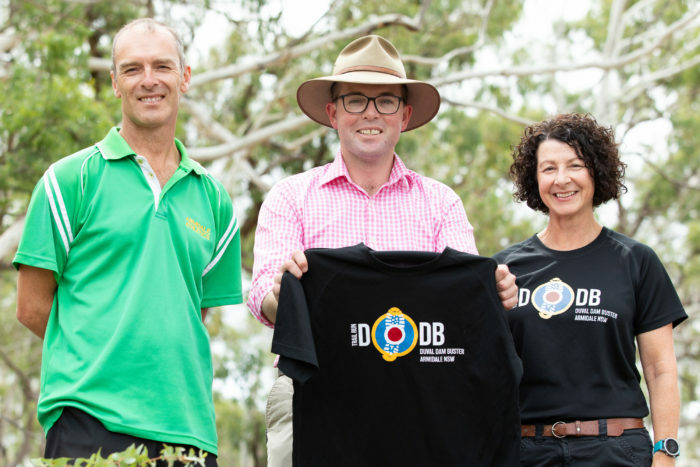 Armidale Athletics Club’s Paul Billings, left, Northern Tablelands MP Adam Marshall and Duval Dam Buster organiser Lee-Anne McKinnon yesterday. ARMIDALE Athletics Club has received a $20,000 State Government funding boost to grow the Duval Dam Buster event into a destination competition for serious runners and fun runners of all ages. Following from the success of last year’s inaugural run, which attracted almost 300 starters – one third from outside the region, an annual event is now being planned. -Anne McKinnon yesterday to confirm the support under Round Two of the 2019 Incubator Event Fund, assisting rural and regional events in their first or second year to grow attendance and boost the local visitor economy. “Whether it is food and wine events or music and sporting festivals, we know that events play an important role in driving additional overnight visitation to Armidale and the wider region, helping to create more jobs,” Mr Marshall said. “Lee-Anne and the Armidale Athletics Club have devised a wonderful event that can be enjoyed by all ages, all abilities and from all points of the compass, while showcasing the natural beauty of the Armidale area. The event is a popular trail run format starting at the Dumaresq Dam picnic area with the option of following the flat course around the dam or taking on the 1,400 metre Mount Duval. Runs will include a 2.5km fun run, a 15km run to the top of the mountain and back or the 30 km double loop dam buster. Mrs McKinnon said the response to last year’s event was surprising with just 100 runners expected and 300 actual starting. “Due to the overwhelmingly positive responses received, we are planning the 2019 event to be even bigger and better, and hoping it will become an annual trail running event in Armidale and the region,” Mrs McKinnon said. “Our aim of providing participants, their families and spectators with an exceptional experience that prompts word-of-mouth positivity amongst family and friends, and brings them back year after year is on track. “Last year’s event brought competitors from near and far and the majority – over 90 per cent – indicated they would return for a future event. The Duval Dam Buster trail run will be held at Dumaresq Dam and Mount Duval later this year with extra categories planned for the mid-range runners and walkers.